Are you frustrated from a lack of results with your strength-training program? Are you struggling to add lean muscle to your body even though you feel like you’re training an adequate amount? The truth is, building muscle is a science, and without all the right information, you could be spinning your wheels and getting nowhere. Don’t miss this quick information guide to building muscle with a list of key mistakes to avoid. How Does Your Body Grow Muscle? Skeletal muscles are made up of literally billions of individual components. Muscle fibers themselves are composed of myofibrils which are made up of groups of sarcomeres which are simply overlapping bundles of contractile protein strands. Each muscle fiber takes cues from a nerve that conducts impulses from the brain which tell it to contract and relax. During intense physical activity, muscle fibers experience “trauma” in the form of damage to their cells. This injury activates what are known as satellite cells to swoop in and start proliferating at the site of disruption in an effort to repair the damage. Satellite cells multiply, fuse together, and attach to the muscle fibers helping to rebuild damaged areas as well as form new muscle protein strands. Some satellite cells will also supply additional nuclei to support increased protein synthesis for muscle growth. You may think that all your body needs is a killer workout to stimulate successful muscle growth, however, it’s not quite as magical as that. 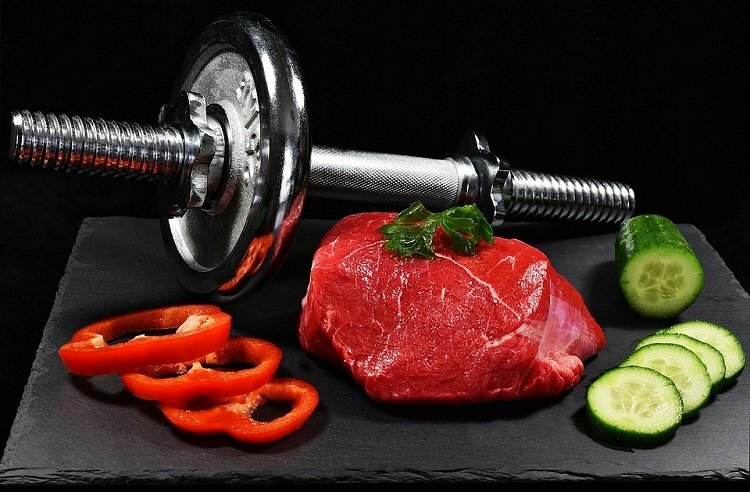 All of your body’s cells need the proper fuel and care to supply the great amounts of energy that are required in the muscle recovery and growth processes. 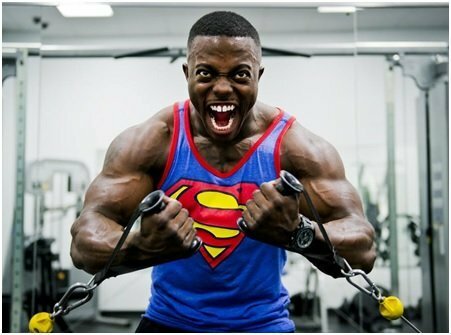 Skeletal muscles are also great adapters and require progressive strength-training and variety of exercise to proverbially break them to a point where your body will build them back bigger and stronger. So what does your body need food-wise to fuel the cells that assist with muscle-building? In short, carbohydrates, proteins, and healthy fats – preferably in the form of nutrient-dense snacks and meals. High-quality proteins like lean meats, legumes, beans, fish, and eggs are a must (and may not fully be replaced with protein supplements). High-glycemic carbohydrates like you find in fruit, grains, sweet potatoes, and winter squash are great for replenishing glycogen stores in the body. And foods like avocados, nuts, Greek yogurt, and olives, offer a healthy dose of the right kinds of fat that support effective hormonal function and metabolism. Are you limiting yourself to weight machines and avoiding bodyweight work or free weights? While progressively adding more weight to your lift can help with increasing your muscle mass to a point, without switching it up every now and then, you aren’t getting the strength-training coverage your muscles need to support one another for greater efficiency and power. High-intensity interval training with bodyweight exercises (planks, lunges, squats, plyometrics, mountain climbers, etc.) is a great way to complement a weight-training routine. Plus, incorporating more variety into your workouts can help prevent common overuse injuries that can land you in a knee brace, ankle wrap, or worse, sideline your workouts altogether. Swapping out regular rest for extra time lifting weights could have an effect opposite of that which you intended. Sleep plays a critical role in muscle repair and creation for a few reasons. For one, when you sleep, you’re using a lot less energy than you do throughout the day. Your body can tap into your energy reservoirs while you rest to more efficiently fuel muscle growth. On top of that, growth hormones are naturally released during sleep which aids muscle recovery. And when you get an adequate amount of sleep, you also allow your brain the rest it needs to keep you awake, alert, and focused the next day which supports more successful workouts. Dynamic stretching prior to resistance training warms your muscles up for exercise making them more pliable and ready for heavy work. Jump squats, a brisk walk, even yoga practice can serve as a healthy warmup that preps your muscles and makes them less likely to tear or strain during movement. When it comes to boosting your own strength, stretching can facilitate deeper breathing for enhanced oxygen saturation, pain and tension relief for increased energy, and greater flexibility for improved muscle plasticity. Not to mention intensified blood circulation to help all those cells going about muscle repair and recovery receive the nutrients they need to succeed.